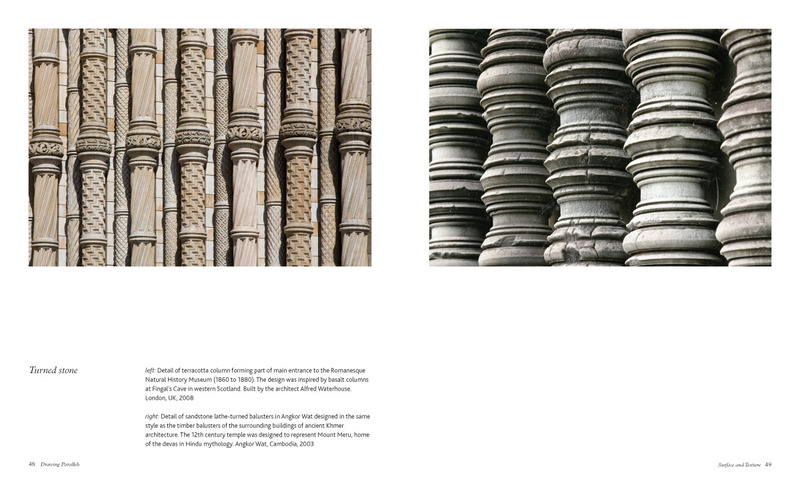 This fascinating book collects about 200 photographs of natural features, buildings and architectural detail from many countries around the world. Each page spread presents two photographs, with brief commentary, for the reader to compare and contrast. It is reviewed here because fifteen of the images are drawn from the London area and it is on some of these that I comment below, along with their comparisons. On pp. 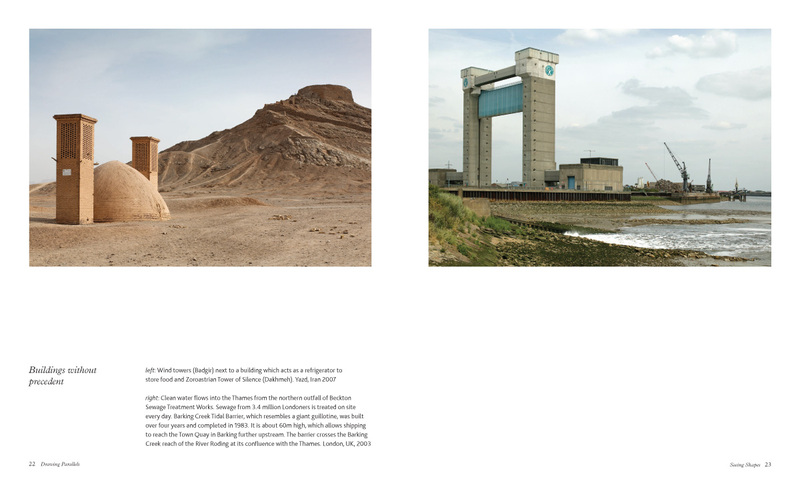 22-3, a bleak Thames estuary landscape comprising the Barking Creek tidal barrier, resembling a giant guillotine, and the outfall of the Beckton Sewage Treatment works, is compared with a drier and more mysterious landscape in Yazd, Iran, with two square brick wind-towers, a conical brick building used as a refrigerator, and in the background a Zoroastrian Tower of Silence. I noted here the hidden nature of disposal – in the case of the Tower of Silence, the laying out of the corpses of the deceased on top of the tower is ritualistic, while the sewage works operate a mechanised and secular process of disposal (though one could compare some Victorian views of the sewer system, outlined by Dobraszczyk in “Into the Belly of the Beast”, also reviewed in this issue, and for which Quintin Lake provided the dustjacket image). Next, on pp. 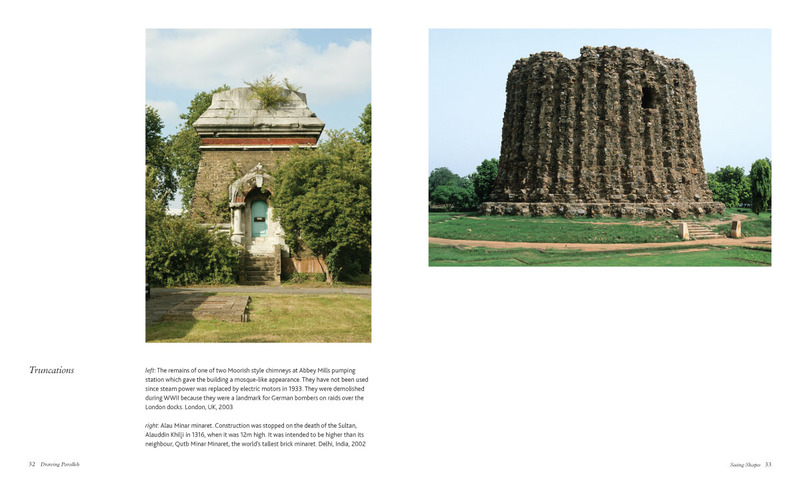 32-3, a comparison between the stump of one of the demolished Moorish-style chimneys at Abbey Mills pumping station (1865-8; these chimneys became redundant in the 1930s and were demolished during the Second World War) and the stump of the 14 th century Alau Minar brick minaret in Delhi, never completed. (Incidentally the Abbey Mills station as originally built is depicted on p. 114 of “Into the Belly of the Beast” and the chimneys are described on pp. 139 ff.). The Abbey Mills chimneys were 209 feet tall. The Delhi minaret was a more ambitious project as it was originally intended to be taller than its extant neighbour, Qutb Minar, at 240 feet the world’s tallest brick minaret. On pp. 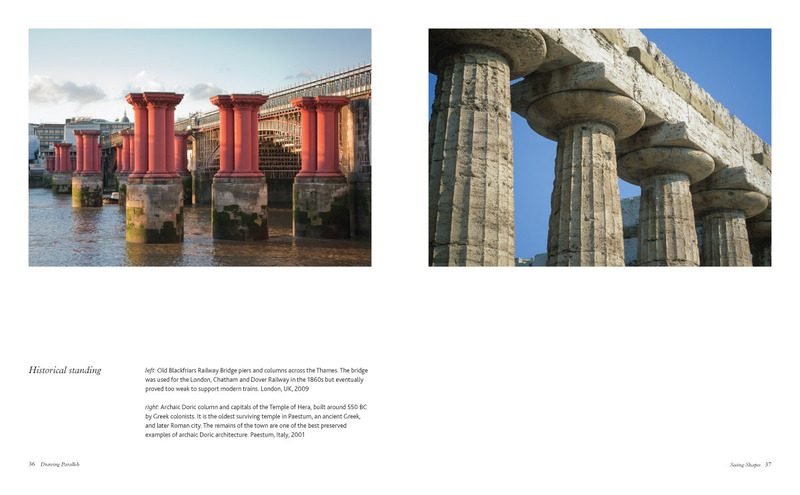 36-7, a view familiar to our readers from the cover of issue 457 – the columns of the old Blackfriars Railway Bridge – are compared with some Doric columns at the Temple of Hera at Paestum (550 BC). In both cases, columns are left supporting not much, but still standing – but compare the materials and finish, and how they have weathered. function of the buildings – a temple of science, and a Hindu temple. Later photographs include the Gherkin, the Tower of London, Rachel Whiteread’s “House”, and vernacular settings in Walthamstow and in South London. A thought-provoking and beautifully-photographed collection to which I have found myself returning on many occasions. The London Society Journal is the magazine for members of the London Society and is published twice a year. The London Society was founded in 1912 and works to stimulate appreciation of London, to encourage excellence in planning and development, and to preserve its amenities and the best of its buildings.